John habitually used his family for models, and he had an extensive clan to call on, as – including his five legitimate children by his wife, Ida, and two others by his mistress, Dorelia – it was whispered that he had sired around a hundred offspring. 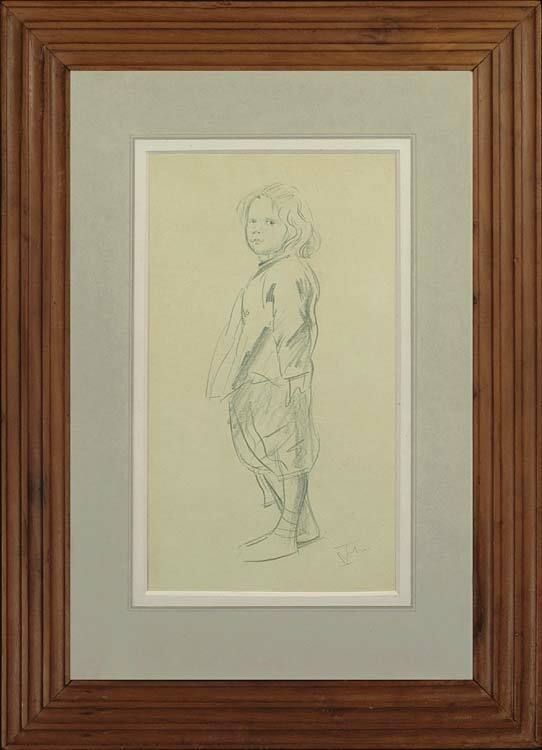 This charming study of a boy, sketched with John’s characteristic brio, bears a decided resemblance to other images of his son Pyramus (1905-13), Dorelia’s child. A similar drawing of Pyramus is reproduced in Augustus John by Richard Shone, Oxford, 1979. John’s natural facility for drawing was honed by his years at the Slade, when – in Henry Tonks’s life classes – the students were required to draw the model without any rubbing out. He acquired the ability to describe poses and drapery in one or two fluid lines; note the folds suggested in the jacket and knickerbockers, and the rapidly scribbled shading. Augustus Edwin John (1878-1961), younger brother of the artist Gwen John, was born in Tenby, Wales. Both siblings studied at the Slade School of Fine Art, Augustus with Henry Tonks and Frederick Brown, where he was influenced by artists such as Rubens. In order to support his family he taught art at the University of Liverpool (from 1901). Here he was introduced to Romany life, which inspired his pre-war work, as did his affair with Gwen’s friend Dorothy McNeil (Dorelia). At the same time he produced landscapes, mainly in north Wales, which introduced an impressionistic style to his work; the landscapes he painted in post-war France are even more colourful and sensuous. During the war itself he worked as a war artist for the Canadian government, producing portraits at the Paris Peace Conference of 1919. After the war he continued to paint portraits, many of the most famous figures of the age, including Lawrence of Arabia (Tate, London), Dylan Thomas (NPG, London), Thomas Hardy (Fitzwilliam Museum, Cambridge), WB Yeats (Tate, London), the politician Gustav Stresemann (Albright-Knox Art Gallery, Buffalo) and the film star Tallulah Bankhead (NPG, London). These portraits were virtuoso performances, skilfully and rapidly executed in pure colour: ‘I fancy portraits should be painted in an hour or two. The brush cannot linger over shabby and ephemeral garments’, John had written in 1902. Augustus John was elected to the Royal Academy in 1928, and was awarded the OM in 1942. Works in public collections include Reverend Father José Maria (Kirklees Museums & Galleries); Sir Caspar John (Bradford Museums & Galleries); and other works: 3 in Cambridge, Fitzwilliam Museum; 1 in London, Imperial War Museum; 2 in Leeds Museum & Galleries; 2 in London, The Slade.